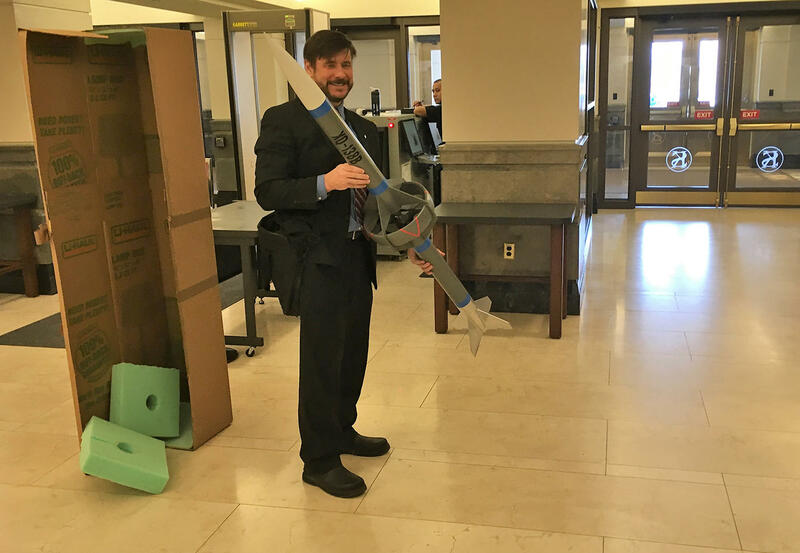 Ron Barrett-Gonzalez, an aerospace engineering professor at the University of Kansas, displays a model of a rocket he brought to show legislators an example of incendiary material he works with in his lab. Kansas public colleges will have to allow firearms on their campuses starting in July. But they’re still battling with the gun lobby over how people should be allowed to carry their guns. In preparation for the law mandating concealed carry on campuses, the colleges have proposed some restrictions. For example, people carrying a semi-automatic weapon on campuses would not be allowed to keep a round in the chamber. But the National Rifle Association wants the Legislature to pass House Bill 2220, which would wipe out any restrictions colleges enact when it comes to owning, possessing, storing, carrying or transporting concealed guns. Representatives of the NRA and the Kansas State Rifle Association were the only ones to testify for the bill at a hearing Thursday. They said some of the colleges’ proposed regulations are overly restrictive and people need to be able to carry weapons unfettered in order to protect themselves on campuses. 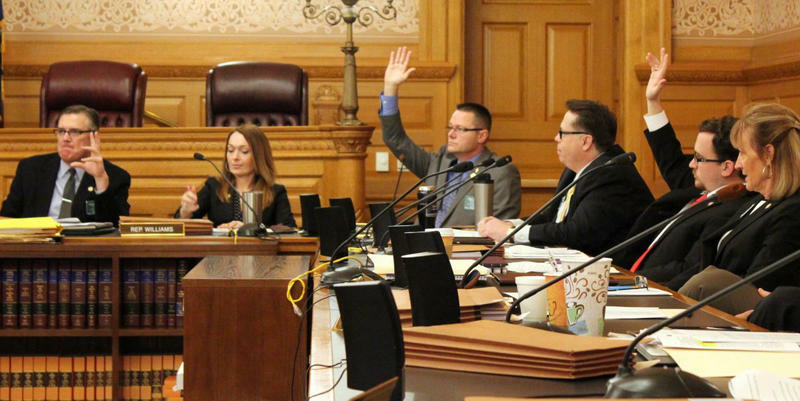 Students, faculty members and Kansas Board of Regents Chairwoman Zoe Newton testified against the bill, saying colleges should be able to make rules to reduce the risk of accidental shootings. Rep. Vic Miller, a Democrat from Topeka, said he thought both sides were being overly dramatic. Miller said that because concealed carry on campuses will only be allowed for people who are 21 and over, it won’t apply to the majority of students. Other states that have allowed concealed carry on campuses have seen few problems or benefits, he said. Rep. Stephanie Clayton, a Republican from Overland Park, said she thought the bill was retaliation against the colleges for pushing legislation to repeal concealed carry on campuses. But Rep. Blake Carpenter, a Republican from Derby who introduced HB 2220, said that wasn’t the case. The repeal effort stalled last month with an 11-11 vote of the House Federal and State Affairs Committee. Rep. John Barker, a Republican from Abilene who chairs the committee, said he has no timeline for a vote on HB 2220. Under the law that goes into effect in July, colleges and the University of Kansas Medical Center will be able to ban guns only in buildings where all public entrances are secured with metal detectors and armed guards. The medical center has said that would be too expensive. During Thursday’s hearing, Ron Barrett-Gonzalez, an aerospace engineering professor at the University of Kansas, said a lab where he works contains incendiary materials. The lab already is outfitted with metal detectors, but he agreed that hiring guards would be cost-prohibitive. Andy Marso is a reporter for the Kansas News Service, a collaboration of KCUR, Kansas Public Radio and KMUW covering health, education and politics in Kansas. You can reach him on Twitter @andymarso. Kansas News Service stories and photos may be republished at no cost with proper attribution and a link back to kcur.org. 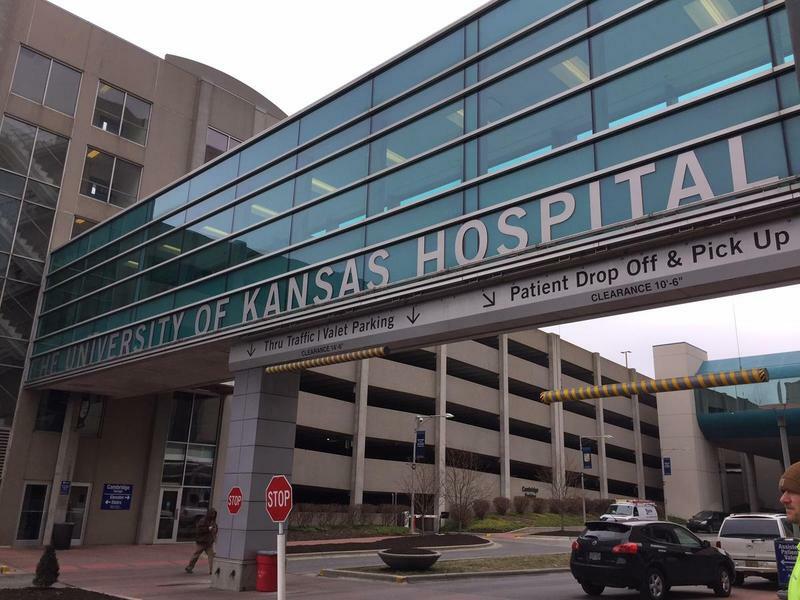 A Kansas House committee narrowly rejected a bill Wednesday that would have allowed the University of Kansas Health System to continue banning concealed firearms. It failed to advance on an 11-11 vote. The chairman of the House Federal and State Affairs Committee, Republican Rep. John Barker of Abilene, chose not to vote to break the tie. The fight is raging on in Topeka over whether to roll back a law that would let almost anyone carry a concealed gun on a college campus or in a library or public hospital. The debate has mostly been around whether guns enhance or detract from people’s safety. Less talked about is just how much allowing guns on campuses could cost. For one Kansas City area institution it could run into the millions. Most Kansas Board of Regents institutions have said they have little choice but to let people carry concealed weapons on university or community college campuses. Mothers, college professors, pastors, teachers and students packed a Capitol hearing room Thursday morning to make this plea to lawmakers: Roll back a law that in July will make it legal for almost anyone to carry a concealed gun on Kansas college campuses and in other public buildings. So big was the roll-back contingent that many there to testify had to be hailed to the room from down the hallway.